The first phase of construction on the South Quarter office towers, completed in February 2017, is benefitting from PENETRON ADMIX, which was used to treat all concrete in the extensive basement structures underlying the towers. Even in the extreme wet and humid jungle-type conditions of Indonesia, PENETRON technology provides concrete with effective resistance that enhances durability. Ready for business: The South Quarter’s three 20-floor office towers and the SQ Dome (with restaurants and shops) sit atop a PENETRON-treated four-floor basement with shops and a parking garage. PENETRON ADMIX is the world’s most efficient and economic permeability-reducing concrete admixture (PRAH), as defined by tests of the American Concrete Institute (ACI). “PENETRON ADMIX is the world’s most efficient and economic permeability-reducing concrete admixture (PRAH), as defined by tests of the American Concrete Institute (ACI),” explains Jozef Van Beeck, International Sales & Marketing Director of The PENETRON Group. “Our crystalline admixture provides comprehensive protection against concrete deterioration caused by water penetration, chemical attack and corrosion, while withstanding high hydrostatic pressure." 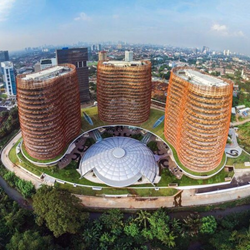 This multi-purpose complex, comprised of three office towers and two residential towers (to be completed in a second phase of construction), stretches over a 7.2 hectare (17.8 acres) area. Each floor of the 20-story towers offers 2,200 m2 (23,700 square feet) of space; at ground level, an extensive retail area – under the roof of the SQ Dome – features restaurants, convenience stores and other shops. The crystalline admixture was mixed into about 20,000 m3 (26,160 cubic yards) of concrete during the batching phase. PENEBAR SW-55 waterstops were installed to permanently seal the construction joints. Finally, all restrooms, balconies and roof structures of the South Quarter complex, about 43,900m2 (472,600 square feet) of concrete, were treated with a topical application of PENETRON, an integral crystalline waterproofing material that is ideal for waterproofing and chemical protection of concrete structures. 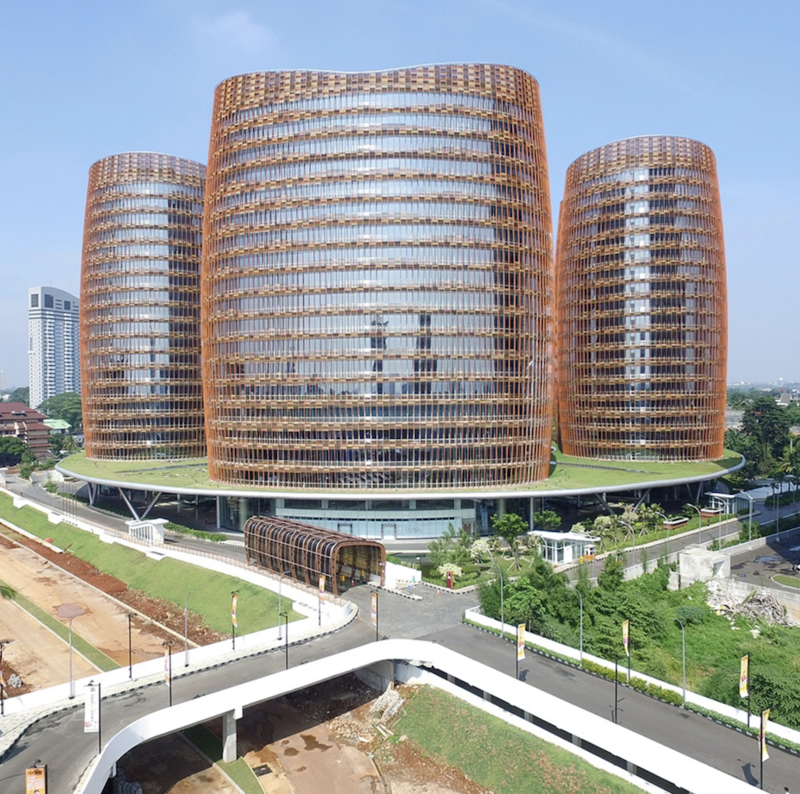 Designed by Tom Wright of WKK, a UK-based architectural office, the traditional Indonesian rattan basket-inspired towers of the South Quarter complex are optimally positioned and laid out to exploit cooling winds and sunlight to reduce traditional energy use by 35%. The certified green development also includes further sustainable features, such as rainwater harvesting and wastewater recycling. Phase 1 done: The South Quarter office towers are positioned to exploit cooling winds and sunlight, reducing energy use by 35%. Two residential towers will follow in a 2nd construction phase.